The Grade 2, $200,000 Rachel Alexandra at Fair Grounds in New Orleans has produced the likes of recent Grade 1 Kentucky Oaks winners Monomoy Girl, Untapable and Summerly. Ten 3-year-old fillies will contest this year's event on Feb. 16 with aspirations of adding their name to that list. The Rachel Alexandra Stakes is the second of three local preps on Churchill Downs' Road to the Kentucky Oaks and awards the Top 4 finishers points based off of a 50-20-10-5 scale. Winner of the Silverbulletday Stakes, which is the first Kentucky Oaks qualifying race at Fair Grounds, Needs Supervision will be looking to secure more points toward the Oaks when she breaks from post three under Joe Rocco Jr. Trained by Jerry O'Dwyer, the 3-year-old daughter of Paynter will attempt her fourth straight win. 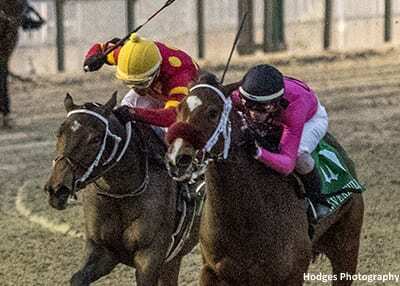 She defeated three next-out winners at Laurel Park when breaking her maiden on Nov. 2 and won a first level allowance race at Churchill Downs later that month over graded stakes placed Meadow Dance and Lightscameraaction. Needs Supervision currently sits at No. 8 on the Oaks Leaderboard with 10 points. She was made the 5-1 co-second choice by Fair Grounds clocker and odds maker Mike Diliberto. She is owned by Gary Barber, Wachtel Stable, Howling Pigeon Farms and Madaket Stables. The 5-2 morning line favorite for the Rachel Alexandra is Summer Wind Equine's Chasing Yesterday who drew post 10, with Drayden Van Dyke named to ride. Conditioned by Hall of Fame trainer Bob Baffert, the daughter of Tapit is a half-sister to 2015 Triple Crown winner American Pharoah, who also was trained by Baffert. She is the lone Grade 1 winner in the field having won the Starlet Stakes at Los Alamitos Race Course on Dec. 8 in her most recent effort. Chasing Yesterday has acquired the most amount of lifetime earnings of any horse in the field having acquired $324,250. She is currently No. 5 on the Oaks Leaderboard. Chasing Yesterday is not the only half-sibling of a Kentucky Derby winner in the Rachel Alexandra field. Michael Ryan's Positive Spirit is a half-sister to 2017 Derby winner Always Dreaming and will break from the four hole under jockey Manny Franco as the co-second choice. Last out, the daughter of Pioneerof the Nile was a stunning 10 1/2-length winner of the Grade 2 Demoiselle Stakes at Aqueduct. She is trained by Rodolphe Brisset and sits at No. 7 on the Oaks Leaderboard. Molto Bella (post one, Julien Leparoux, 10-1), Street Band (post two, Sophie Doyle, 20-1), Serengeti Empress (post three, James Graham, 6-1), Liora (post five, Channing Hill, 12-1), Oxy Lady (post six, Adam Beschizza, 6-1), Bell's the One (post seven, Florent Geroux, 8-1) and Eres Tu (post eight, Ricardo Santana, Jr., 12-1) complete the field. The Rachel Alexandra Stakes is named after the 2009 Horse of the Year and Hall of Fame inductee whose sensational 3-year-old campaign included victories against colts in the Preakness Stakes, Haskell Invitational and Woodward Stakes (all Grade 1). Originally owned by Dolphus Morrison and trained by Hal Wiggins, she was privately purchased by Jess Jackson's Stonestreet Farm and moved to the barn of Steve Asmussen following her runaway victory in the Grade 1 Kentucky Oaks, which she won by 20 1/4 lengths. Her 3-year-old campaign included a victory in the Grade 2 Fair Grounds Oaks. This entry was posted in Racing and tagged always dreaming, american pharoah, Bob Baffert, chasing yesterday, jerry o'dwyer, needs supervision, paynter, positive spirit, Rachel Alexandra, rachel alexandra stakes, summer wind equine by Ryan Martin/Fair Grounds. Bookmark the permalink.